Danina Lanfear (l) and Ethelwynne French (r) on the Lanfear-French Farm. From The Glamour of British Columbia by H. Glynn-Ward. 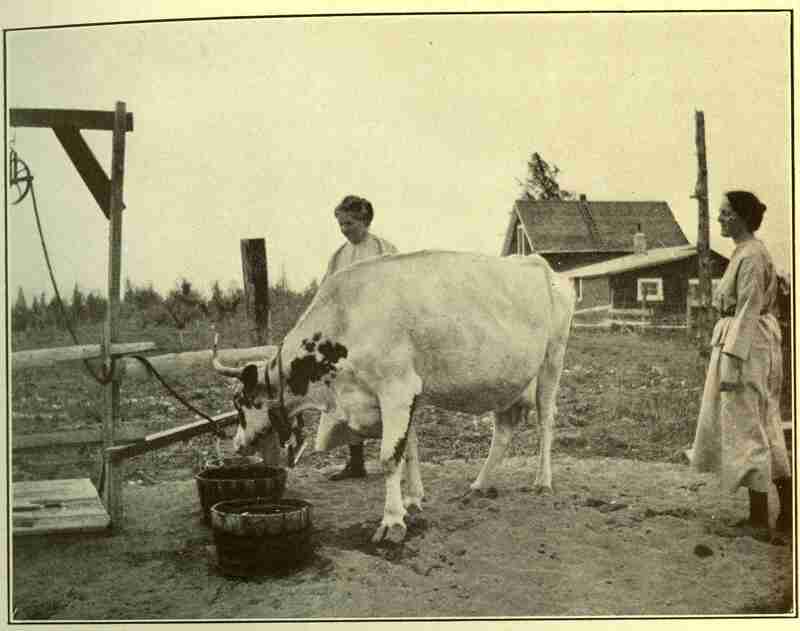 “Two Women Make Good: Are Working a Farm and a Summer Home Without a Man About Them,” proclaimed a headline from a 1927 edition of The Omineca Herald, offering an intriguing glimpse into the lives of Danina Lanfear and Ethelwyn French, whose contributions to early Terrace are often not acknowledged. These women moved to Terrace from England and stayed here for 16 years, becoming valuable and celebrated members of the community. While alive, they were admired within the community, but today their legacy is rarely discussed. However, they should be remembered for their hard work, dedication and their commitment to each other. Danina Hood, later Lanfear, was born in Scotland in 1869 and immigrated to Australia with her family at age three. As a young girl, she excelled in grammar school and eventually went on to study at Sydney University, where she graduated with a Bachelor of Arts in 1894 – less than a decade after the first female graduate. After briefly working as a teacher, she married Charles Ernest Lanfear, a brewer, late in 1899. They had four children: three boys and one girl, Margaret. Charles was frequently accused of incompetence, and often sued his former employers for wrongful dismissal and libel, with varying degrees of success. It’s unclear whether or not this string of court appearances contributed to the family’s decision to leave Australia, but whatever the case, the Lanfears sailed back to England in 1909. While in England, Danina met Ethelwyn French, a teacher with an associate’s degree in piano from the London College of Music. Census documents place them both in the small community of “The Grove,” Staffordshire, early in the 20th century. It’s possible, although not certain, that their relationship provided the catalyst for Danina leaving Charles. The exact nature of their relationship is unknown, but ultimately what matters is that for the rest of their lives, their primary devotion was to each other. A ship’s record from 1914 shows Mrs. Lanfear, Miss French and an 11-year-old Margaret leaving Liverpool for Canada. After arriving in Terrace, Danina and Ethelwyn bought land from Charles ‘Speakeasy’ Green at the top of what is now called Lanfear Hill (the name was used as early as 1923) and began farming. Photo from Lanfear Hill, likely taken shortly after Lanfear and French left Terrace. Heritage Park Museum Collection. Elsie Smith, quoted in a 1989 The Terrace Review article, later described them as “two rugged women,” a quality that would have been necessary given the amount of work they did. Their efforts resulted in a sprawling farm and garden, which produced many prize-winning entries in the annual fall fair. Lanfear and French were particularly known for their flowers, their fruits and vegetables, and their poultry. The women were able to capitalize on their successes by selling their flowers, ready to plant, throughout the community. The pair further demonstrated their business savvy through their Hill Farm summer home. The bench became known as “where the sun shines,” and the women advertised it as an ideal place to rest and absorb vitamin D, which had recently become popular. The farm and summer home featured playgrounds, a tennis court, and gardens, as well as both indoor and outdoor rooms. The women advertised milk, eggs, fruit and vegetables and offered full supervision of children. Hill Farm received many visitors, both children and adults, including D.T. Pattullo, an MLA who later became a premier of British Columbia. Lanfear and French contributed to the community in many other ways. They supported the war effort during the First World War, volunteered to nurse influenza patients in a makeshift hospital in 1919, and contributed to both the Nurses’ Home Fund and a canvass for the Terrace hospital. Lanfear was briefly a teacher in the schoolhouse, and French taught piano lessons for many years. Although they returned to England in 1931, their contributions were numerous and significant, and as a result the goodbye dinner held for them at Knox United Church drew 50 attendees. The farm area subsequently became the property of the Kerby family. The pair stayed together for the rest of their lives. In a history often dominated by men, it’s important to remember two women whose primary relationship was with each other, and to recognize their contributions to Terrace history. Madeleine Link is a student at the University of British Columbia. She is spending the summer as Heritage Park Museum’s digital assistant. This article was originally published in the August 17, 2016 edition of the Terrace Standard.